The Information Age has invaded our slow-tempered lives too suddenly to get used to everything new. Smartphones have replaced most gadgets of late 90's and early 00's. They've influenced almost all aspect of our lives from learning to communication to entertainment. Music's always been a major (if not the essential) part of the modern entertainment, and most smartphones are usually stuffed with at least a dozen of music apps. We have Bandsintown for buying tickets for gigs, Last.fm for showing off our 'unique' music tastes, Shazam for discovering music we hear around and many many more apps for all occasions. The only kind of music apps that is still open to dispute is the way of listening to music. The main cause of this conflict is that there're too many of them. On the one hand, there are streaming services. Apple Music, Spotify, Deezer and the rest offer a huge amount of music-on-demand, activity-based playlists, online radio, recommendations but what all of them lack is good quality music. High-Resolution music a.k.a. Hi-Res refers to digital formats of the highest quality which usually sound exactly as the original recording unlike MP3 (and other lossy formats) which are compressed to reduces their size. Unfortunately, it's not only the size that is reduced. During the compression process, some parts of a recording that are not 'important or hearable' are thrown away, so many listeners never had a chance to hear what artists had in mind composing a song. It's like taking a film and then cutting off each tenth frame. What would Mr. Woody Allen say? I'm pretty sure he wouldn't like it. However, it's not all that frustrating. Today, I'm taking a look at an audio player designed for those who cherish the quality, functionality and the absence of unnecessary features that only stand in your way when just feel like listening to something. Today, I'm talking about VOX Music Player, which I can, without doubt, call the best audio player for iPhone. VOX Music Player for iPhone is a game-changing audio player created by audiophiles for audiophiles. 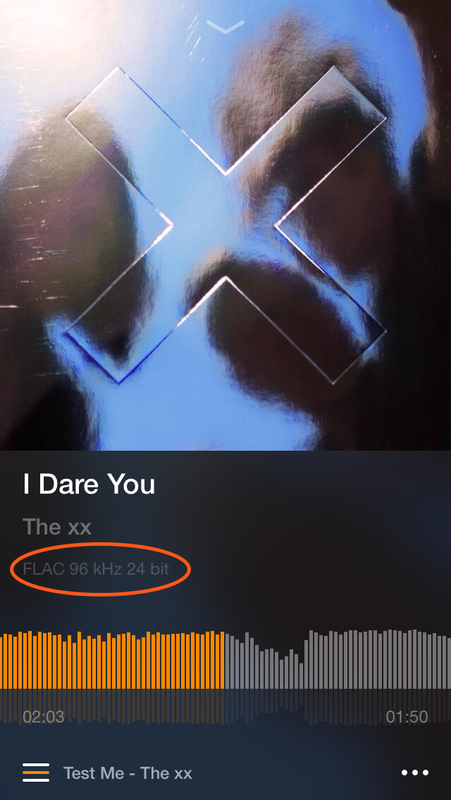 The iOS version presents a minimalistic audio player with a few section only. These are Library, SoundCloud, Collections, Radio, and Settings. Library is the music available for listening. It's comprised of you local tracks and those you have on a music cloud called LOOP (more on that later). SoundCloud allows you to stream from the biggest music platform, like ♥, and add tracks to your playlists. In Collections, you can play and manage your playlists. Radio is an additional feature that allows you to listen to as many as 30,000+ radio stations from all ver the world. You can sort the stations according to country or genre. In Settings, you can sign in to Spotify, SoundCloud or Last.fm to stream, add, or scrobble songs to keep up your music stats. The main this about VOX for iPhone is that it can play most audio formats, both lossy and lossless. Lossy vs. Lossless: what's the﻿ difference? It's to developers credit that VOX sounds so good since they put a heavy emphasis on the sound engine which has a brand-new bass-enhancing technology. What else do you expect from the best audio player for iPhone? It already plays all the formats you know. It has a great and simple design. It lets you integrate with SoundCloud and Spotify. But there's one more feature that solves the issue of the huge size of Hi-Res files. The solution is called VOX Cloud (formerly LOOP Unlimited Music Cloud Storage). VOX Cloud eliminates the need in cleaning your computer to have some free space or using external HDDs or NAS devices. You don't depend on streaming services, either. Moreover, as you may know, most of them stream at 128 kbps, which is no good at all. VOX Music Cloud Storage is an unlimited music cloud, that's why it doesn't matter whether you have thousands or millions of songs – VOX Cloud can store all of them. The key reason to start using VOX Cloud is that it syncs your music collection in VOX Music Player for iPhone and Mac. It works like this – you add songs to VOX Cloud on Mac (or via VOX Premium web-account), and they automatically appear in VOX for iPhone. This service is available exclusively for VOX users. It's a perfect solution to all your troubles you might face using iTunes or any other audio player for iPhone. VOX Player for iPhone streams directly from VOX Cloud, but unlike other music cloud storages, no song is compressed or converted to some formats. It is an ideal music player for music lovers, average listeners and anybody who appreciates quality and functionality. In practice, it means that whatever you upload to VOX Cloud remains in its original format and quality. To compare, Amazon Music, Google Play Music, and iTunes Match convert everything to either MP3 or AAC. VOX Cloud is a great option providing you prefer Hi-Res to poor quality. VOX Premium makes it possible to listen to FLAC, AIFF and other Hi-Res formats on iPhone. For the times you may not have internet data, you can download a song or an album to iPhone to listen to it offline.